Author: Gregory, Jill Set In . . . Description: In a place called thunder creek, two wary hearts are about to get a second chance at love. 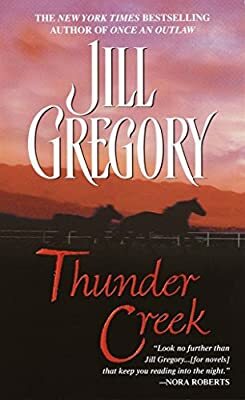 When Katy Templeton fled her small Wyoming town and its painful memories, she thought she’d said good-bye to Thunder Creek forever. But now the prodigal daughter has come home. Home to the relentless ghosts of the past. Home to Jackson Brent, the lean, hard cowboy with the lazy smile--and the last person on earth she ever wanted to lay eyes on again. Time and tragedy had come between them, but Jackson never forgot his best friend’s kid sister. The coltish beauty blossomed into a stunning woman, burned by love yet unafraid to take on the whole town to get justice for her family. Katy blames him for her beloved brother’s death, but as she digs for answers about that fateful day fourteen years earlier, there is someone ready to kill to keep her from getting them--and Jackson might be the only one who can save her. He wants her safe--and in his arms, but Katy can’t rest until she discovers the truth. Fighting her red-hot attraction to Jackson, Katy risks everything--even the yearnings of her own heart--to unravel the truth about her brother’s death.